The human body is like a machine, with working parts that all contribute to the health and activity of the individual. Of course, this might be difficult to explain to kids -- particularly when it comes to the unseen parts, such as the muscular system. By using games and activities to illustrate your explanation of the various systems of the body, you can help your children better retain knowledge of muscles and tendons. 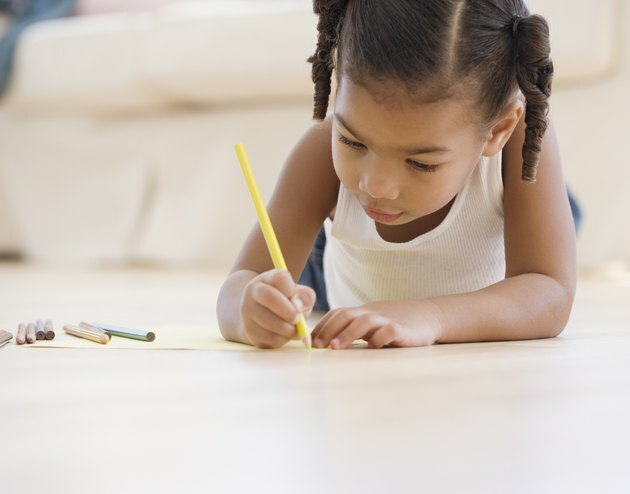 One way that you can help kids visualize the muscular system and all of its parts is by creating self-portraits for each child, depicting the location and names of major muscle groups. Start by tracing the child's body on a large piece of butcher paper. Then, use a model or picture of the muscular system in an encyclopedia or online resource to name the major muscle groups, including the deltoids, pectoralis and abdominus muscles. Ask the kids to draw and label their own muscle groups on their portraits, offering a chance to create a visual reference for future lessons. Part of understanding the muscular system isn't only being able to name each muscle group, but also knowing the functions for which each group is responsible. After a discussion of muscles and their functions, try creating a memory match game. Get an equal number of cards and label a set of two -- one with the muscle group name and one with the muscle group function. Continue the process for each muscle group until you have a set of cards. Shuffle them and lay them face down. The kids then take turns turning over two cards at a time, looking for a match of group and function. When focusing on the muscular system, it's easy to forget about the smaller muscles groups, like those found in the face. Let kids see how the muscles in their faces affect their facial expressions. Supply the children with small, hand-held mirrors and ask them to make facial expressions -- sad, happy, surprised, scared and so on. Ask children to note the way the muscles in their faces contract and move. You can even talk about the muscles in the tongue by getting children to stick out their tongues and move them around, suggests KidsHealth. The muscles in the human body require regular activity to stay healthy. Children should understand the importance of physical activity as a way to maintain strength and flexibility. The Henry County School System suggests having children create their own exercise programs, including cardio activities, flexibility exercises and muscular strength exercises. Have the children choose five or 10 exercises and explain how each benefits the muscular system.